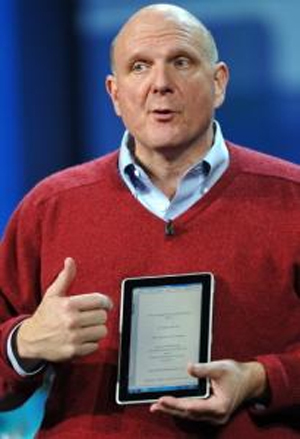 Hewlett Packard has entered the tablet PC fray with the HP Slate 500 vs Apple iPad vs Samsung Galaxy Tab vs RIM Playbook, et. al. The HP Slate 500 is a business tablet PC as opposed to the other tablet PCs being more oriented towards consumers, entertainment, and social networking. The Slate is $799 and availabe now, the Apple iPad is $499 and $699, the Samsung Galaxy Tab is $599, and the RIM Playbook price is yet to be announced. Two videos are below. In the first video, Crunch Gear takes a hands-on look at the HP Slate 500 tablet PC. The second video is a Hewlett Packard promotional. (CrunchGear) Here is our hands-on video of the HP Slate 500, HP’s new business slate. For those of you still on the fence, HP has posted all of the final specs for the device as well, including the fact that it has an active digitizer as well as an Intel Z540 Atom Processor Z540 (1.86 GHz, 512 KB L2 cache, 533 MHz FSB) and 2GB of memory. (HP) HP introduces a slate for businesses. The new HP Slate 500 Tablet PC runs Windows 7 and supports a wide variety of business solutions, from retail point-of-sale to hospitality, insurance, healthcare, or any custom business application. Sony Launches Version of Google TV (Videos) "Sony Internet TV with Google TV"
Wow, and yet all I can think about is: I have purchased millions of dollars of HP gear and personally have 2 HP laptops. HP loads their gear with unusable product that interferes with the productive operation of their h/w. I am a complete PC, and not Apple user, I'd still take a change on ANY of HP competitors to give me usable function. Too bad, this looks like a sweet product but I'm convinced it will only take HP to screw it up, my decisions to buy HP have been some of the worst of my IT career. I like to purchase this item thanks a lot for this great information keep posting and updating the blog on regular basis.